Xydias, for those who might not know him, was the founder of the So-Cal Speed Shop, the quintessential home of the hot-rod hobby way back when. He started it in Burbank when he was discharged from the Army Air Corps after WWII. The shop quickly became known for its fast cars, setting records on the lakes and at Bonneville back when hot rodding was becoming a real force in the car world. So-Cal cars were the first to go 170, 180 and 190 mph. 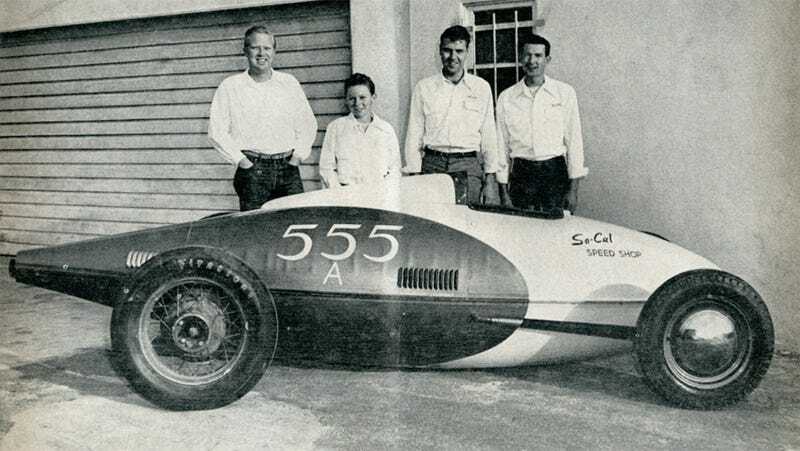 The So-Cal streamliner went 210 mph in 1950. Brave men. This is "The Hot Rod Story," a documentary shot by the man himself from about 1962 to 1964 at the drag strips, dry lakes and cruise-ins of the day. It's a movie shot in the style of, say, a Bruce Brown surf movie or a Warren Miller ski movie. Xydias narrates a story strung together from 16-mm film shot at the places where the action was. Serious documentary is interspersed with corny jokes. If you've ever seen the genre—especially if you saw it in a high school auditorium or Civic Center back then—you'll love it. If you weren't around at the time but always wondered what it was like, this is your chance. On Saturday, June 14, you will have a rare opportunity to meet the legend himself as he introduces and narrates the film once again. The event is called "A Night at the Movies with Alex Xydias." It will be held at the Sheraton Fairplex Conference Center on the grounds of the Pomona Fairplex in Pomona, Calif., the same facility where they hold the Winternationals and the Finals every year. It's also the Saturday night of the L.A. Roadster Show weekend, so you can spend the day looking at the hot rods then spend the evening watching the movie. The evening is a fundraiser for the Alex Xydias Center for the Automotive Arts, which is a real-live entity that teaches the performance-car hobby to local high school kids who no longer get to attend auto shop in school. If, for some reason, you cannot attend yourself (and it better be a darn good reason, like you live in an iron lung or you're in Joliet serving life-plus-25 for speeding), you can order your own copy of the DVD through the So-Cal Speed Shop, also in Pomona, at socalspeedshop.com. And you get to meet Xydias himself. Maybe he'll even sign your program. Image from Bellytanks.com. Xydias is 2nd from right.